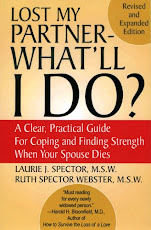 When a spouse/partner dies, it’s common to feel some anger. You may not recognize it, but it’s usually there. Anger, however, may feel especially uncomfortable when it occurs around a death. Many people feel guilty or uneasy about acknowledging the anger. These reactions are understandable, if you keep in mind that death creates the ultimate experience of abandonment and helplessness.